(Aug. 9, 2018) -- It’s never too early for high school seniors to start thinking about applying to college. Prospective students can apply now for the upcoming Fall 2019 semester using the ApplyTexas application. ApplyTexas is the online portal that incoming undergraduate students use to apply to public universities across the state and for general UTSA scholarships. UTSA provides a streamlined application process and has region-specific admissions counselors who are available to provide a wide range of services and materials and to guide incoming students through the early admission process. Students who need help deciding on a major are encouraged to explore UTSA’s areas of study. 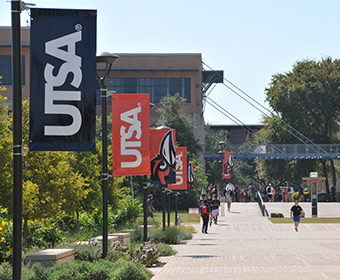 UTSA offers 60 undergraduate majors. This diverse set of academic programs are curated by award-winning faculty and will help students take the first steps into nearly any professional role or scholarly pursuit. UTSA is a public urban serving university specializing in health, cybersecurity, energy, sustainability, and human and social development. With nearly 31,000 students, it is the largest university in the San Antonio metropolitan region. UTSA advances knowledge through research and discovery, teaching and learning, community engagement and public service. The university embraces multicultural traditions and serves as a center for intellectual and creative resources as well as a catalyst for socioeconomic development and the commercialization of intellectual property—for Texas, the nation and the world. Learn more about admission to UTSA or apply now.